I must confess that most naked VTRs leave me somewhat indifferent but you seem to have put the pieces togehter just right. Congrats on a nice job. BTW, what subframe are you running? Very nice looking. Radiator in the tail section? I like the inspection sticker on the tail light. Any cops see it yet and allow its location? Looks good! What part of WA are you in? Way way way nice, man! Damn that's a good looking naked. Really great job there man. Looks clean and simple. I bet its a blast to ride. One day I would love to build a cafe racer out of a superhawk. 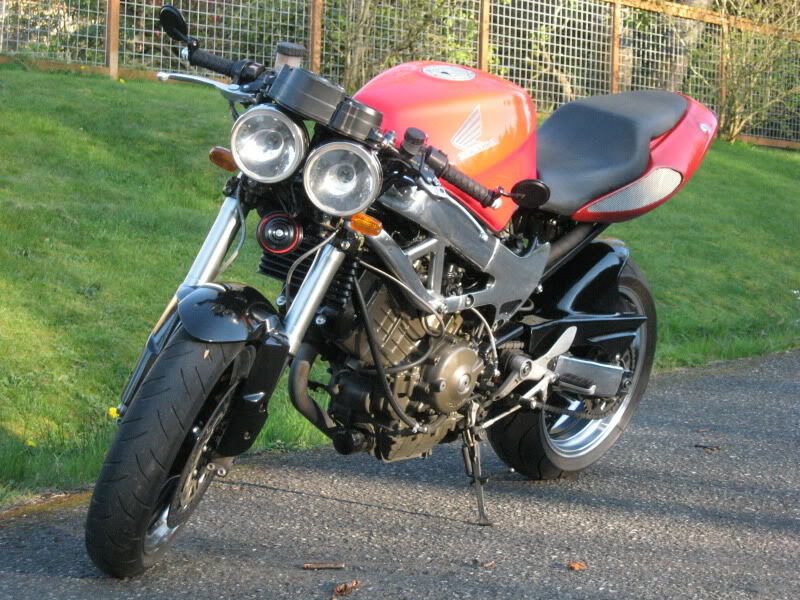 Sort of a retro Egli Vicent, Ducati classic mish mash. Enjoy your ride. I agree but this one is nicer than just about anything else I've seen. What radiator was used, VLX? What oil cooler? Any install pic's? Like Mikstr said, most nakeds are just "Meh" to me but yours looks very nice. I think the only thing I would work on would be how to clean up the oil hoses that go all over the place. One of the things that makes or breaks a naked to me is doing away with the clutter and with that one exception you have done a great job. How does it run with the two into one setup? Loud? That looks eerily familiar...........it's nice to see more undertail radiators, really cleans up the lines of the bike. Nice job, let's see the fan set up. 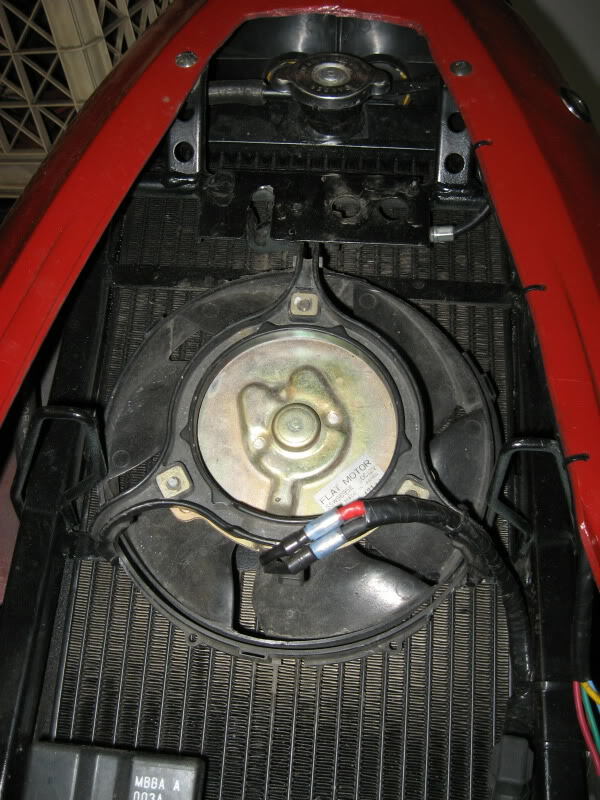 mikstr- subframe is a chopped down stock unit. tophatflash- mostly between Seattle and Bellingham. 7moore7- I'd like to run a cowl at some point, though I narrowed my tailsection so the stock unit would be too wide, wonder how it would look narrowed with a small ridge down the center? As far as running, she runs pretty well, I followed the carb setup guide on this forum and it worked well for me. Good, even power throughout the rev range but I do still need to tweak my idle circuit as i get slight popping with the throttle fully closed below 3K RPM. Kai Ju- It is fairly similar to your build. 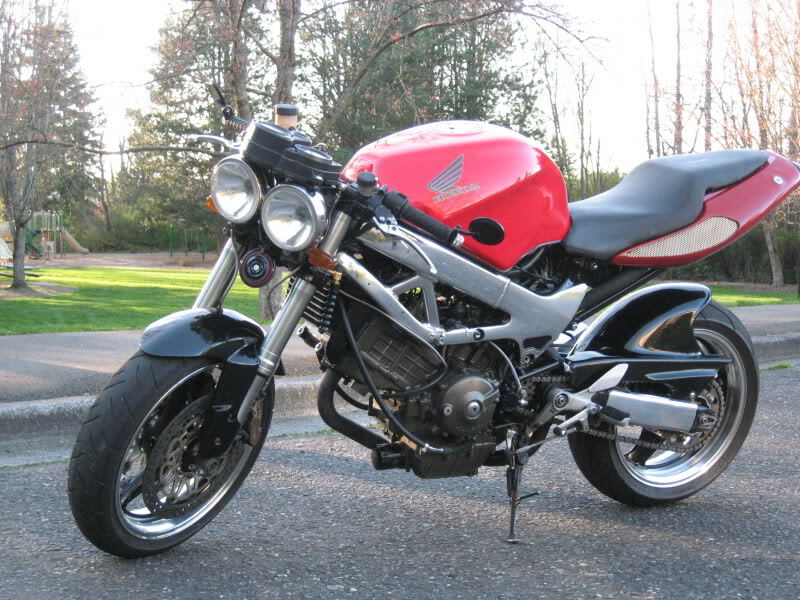 I actually saw some frustratingly small pictures (couldn't find full-size at the time) of your bike before i bought mine ~1 year ago, I believe it still had the factory tank? 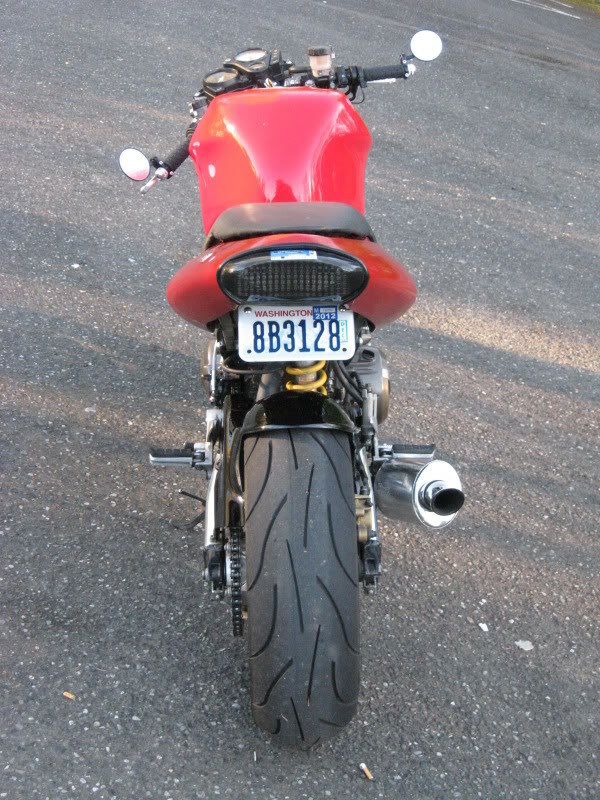 Your bike was the one that inspired me to do the undertail radiator and the venting. Believe it or not, i hadn't actually seen your build thread or detailed pictures of you bike until I dug it up today after reading your post. 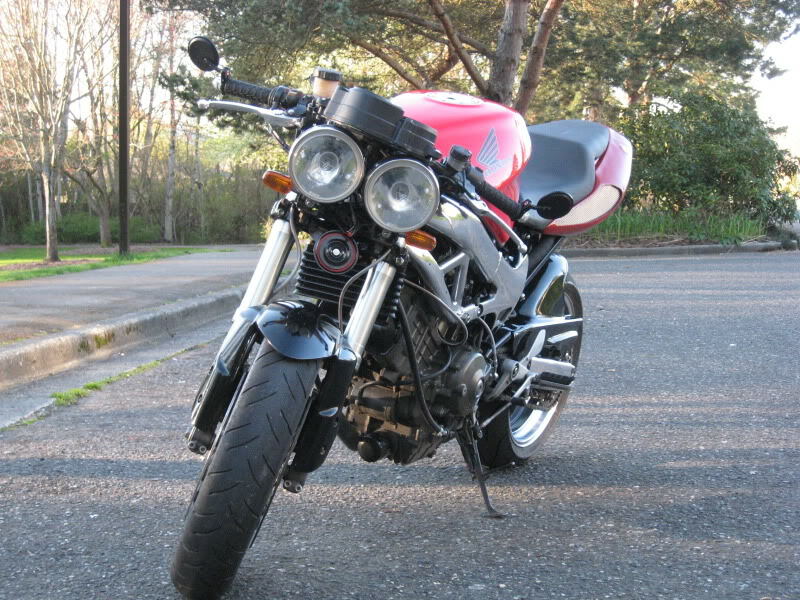 The two bikes do indeed have eerie similarities: Ninja oil cooler, CBR954 forks, undertail, venting, VFR800 tank, etc. To all of you, thank you for the kind words. To be honest, I was a little apprehensive to post this up as most are not fans of 2 into 1 exhausts and naked Superhawks. I got the bike almost a year ago now. When I picked her up she was in pretty sorry shape. 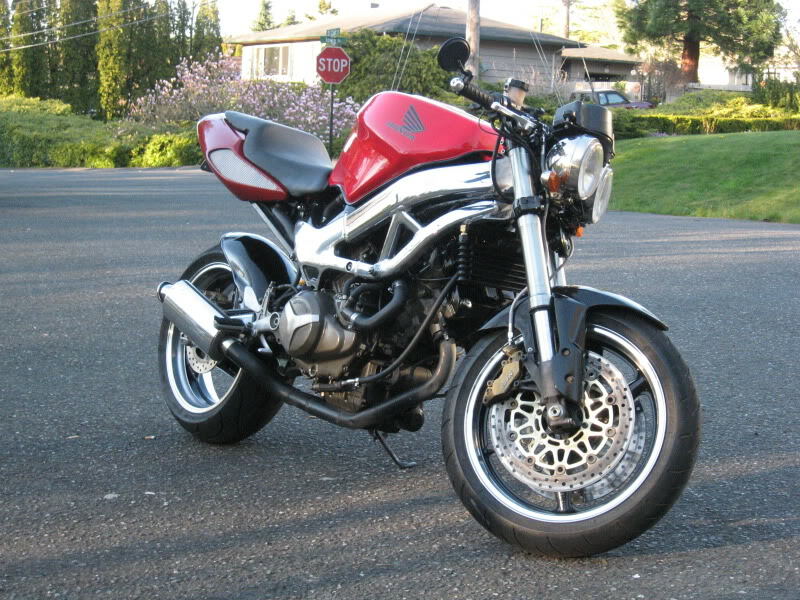 The bike had been down twice in the past, once on either side, and the previous owner had torn a lot of parts off en route to a minimalist, naked fighter. 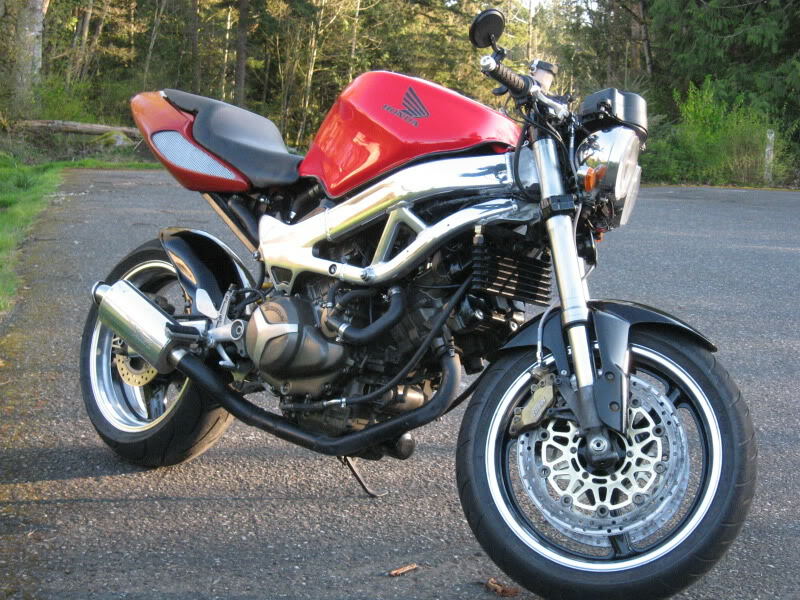 She was sporting a bent pair of GSXR600 front forks (minus the rotors and master cylinder) No bars, no ignition switch, no gauges, no headlight, no fairing or fairing stay. The frame was covered with scratched black paint, the tank was included but had not been made to fit (no mounts or block-off). Factory airbox was included with a K&N but the velocity stacks had been chopped in an effort to mount pod filters. Rear cylinder head was off of the bike (apparently for porting?). Exhaust had been cut up as a start to the 2-1 setup. Tail fairing had been sectioned 2"? narrower. Lastly... all connectors for hand controls, gauges, etc had been cut off of the harness. I had a pretty big project on my hands. -2-1-2 high mount exhaust, I like the look and sound of the setup I built though am probably losing some power. -clean up lines and wires further. 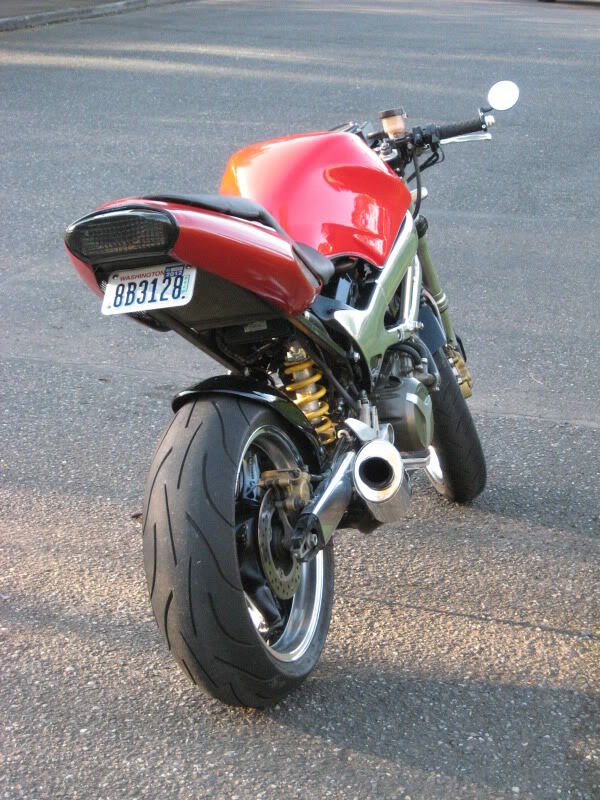 -I have an RC51 SP1 swingarm and CBR954RR rear wheel that will find their way onto the bike eventually. -Racetech internals for the front shock and a new rear. 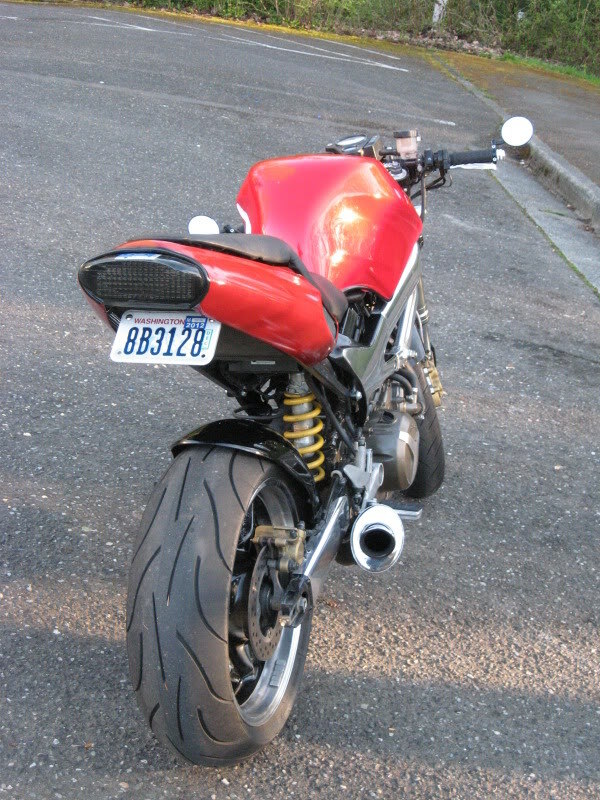 -custom 2-1 exhaust (cut and pieced together factory parts) with viper silencer. -Converted the CCT's to manual via the stainless carriage bolt method. -stock airbox, paper filter, stock velocity stacks. Bigger jets, lifthole block, shimmed needles. 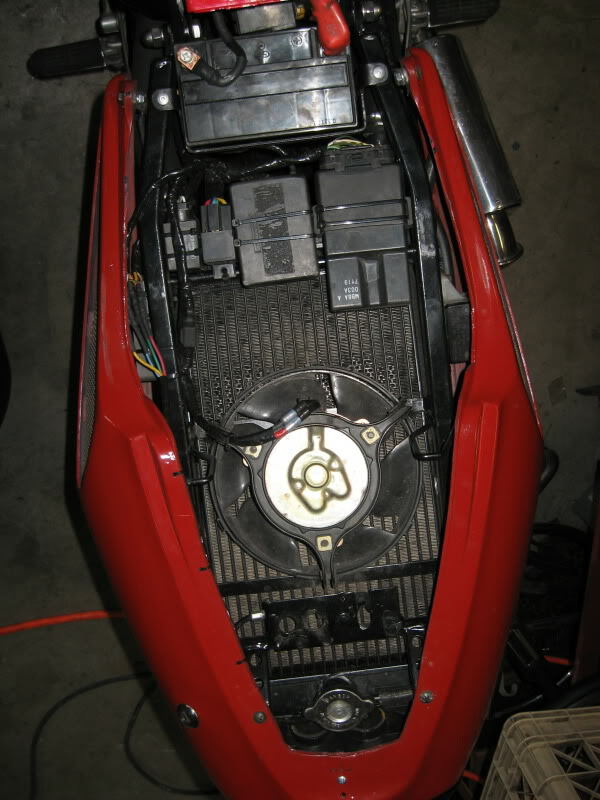 -mounted coils to LH rear of the airbox. -Re-mounted all electrical and shortened the entire harness accordingly. -New mount for the factory-style cluster and wired on new connectors for everything. -Headlights on relays w/ a diode bridging the two so low beam is one light and high beam is both. Awesome narrower tail, I didn't even notice that first time around. And a line down the middle of the cowl would probably look sick. wonder what he got for his bike? Oh...one other thing...where did you get that gorgeous rear hugger? NOT a fan of nakids but this bike is a real work of art. I want more details on the tail rads...... Does the fan run all the time? Is it one rad or 2? What rads? Why a huge tank on a bike that doesnt want to go that far? Most are not overly excited about wrecked bikes the owners can not afford to fix being turned in to "Street fighters" which normally means no more then rip off the broken bits and bolt on random parts to get it back on the road. YOUR build is about as far from that as it can be. Nice work, and while the Street fighter look is not for me... Yours looks good. Really only two things that look..."unfinished"
The horn placement.. and the oil filter, normally hidden by a cowl or faring. The Horn... not sure tuck it up at the cost of loosing volume and reach..
Or, machine the case to except AN fittings and remote the filter to a new location. And as suggested, you have done well with cleaning up the front end area normally covered in plastic.. ditching the coils and going with COP would extend that work. Over all nice work.. and.. if I built a Nekid SH, it would look like this one. And I just got that exact same hugger, so thanks for the pictures, now I know how it mounts. How did you mount the stock guages?